Warning: this post contains exam rants and regrets. Please don’t read further if you cannot take some whining! Because this one contains a lot of whining! Okay, the real title of this blog post should be The Post Exam Promises That I Always Break. Yup…. I made the same darn promises over and over again since I was a kid every time I finished an exam, but I always ended up breaking them after some time. My consistency and reliability in breaking my post-exam promises is so impressive, the chance that I will break them again this time will be almost 1. The event here being: Afiza breaking her post-exam promises again. I will study consistently and be prepared as early as many, many months before my next exam. I will not rely on study leave alone in order to cram everything. Study leave duration is NOT ENOUGH to really learn everything I should know. I will not repeat this mental torture ever again and will be more committed and consistent from now on. Please God, just let me pass this one and I will behave MUCH better for my next exam. I will only read commercial fiction once a week. For the rest of the week I will make myself study and venture out into other necessary life activities. I will be more community-oriented and sociable and I will go out with friends and ACTUALLY socialize with REAL people rather than with imaginary characters of a book. I will learn to be nice and tolerant with other people when I socialize with them (which is something I don’t have enough practice doing because I always spend time with books). I will not let reading fiction monopolize the bulk of my time to the extent that I ignore the more important aspect of my life such as my academic learning and my relationship with my friends, and neighbours and my own family. I will keep in touch with all my friends after this exam and will not abandon them the way I did during my study leave. I will be NICE. I will reply whatsapp messages promptly. I will return phone calls straightaway. I will read more religious books and non-fiction. I will spend my time wisely. I will have more self-control regarding the frequency of my fiction reading. You have no idea how difficult it is for me to keep those promises. And like I’ve said before, I always break those particular promises. The lure of new books from my favourite authors and new stories from new authors… they will ensnare and entrap me in mid-resolve and I lost myself. It is ridiculous how much time I arrange my activities around my reading habits. The problem is, it is so hard to change the habit of a lifetime. When I am exhausted, I want to read stories to relax. When I am already relaxed, I want to read books to maximize this pleasant feeling of relaxation. When I am sad, I want to read stories to remind me of happy endings. When I am happy, well, I thought I should multiply this happy feeling by reading. It will make me even happier. When I am angry, I read stories to calm down. When I am calm, I read stories so that I can absorb them better. See? I can find many excuses and various reasons to read fiction for every occasion and every emotion. But these stories are junks! They are pure entertainment! They are not real! I didn’t gain any earth-shattering insight or ground-breaking information from them. In fact, my hobby is correctly termed as ‘lagha’. While it might be okay for me to indulge in them once a week, but to do so for MOST of whatever free time I have….day in and day out… that is like a sickness. I know that! Yes… you have no idea how many times I berated myself. But like I said, I had done the same self-scolding in the past, but I always forget and relapse into my addiction every time the exam is over. And I totally blamed myself. Because time is so precious and I have been wasting them by reading fiction all these time and simply relied on study leave to cram everything. The problem with me is that, I will only do something I dislike when I absolutely have to do it. And study leave and exams force me to study when all I want to do is to read fiction, write my book reviews and occasionally exercise with hiking, jogging and an occasional weight training. Those are ALL I want to do during my free time when I don’t have exams. I am absorbed in them and I think those activities are more than enough to keep me fully occupied and satisfied. So you see, without exams, it is so easy for me to allow myself to drift away in the clouds of my fantastic tales. My parents had been saying to me since I was a child, “Kak Ngah, cuba kalau Kak Ngah baca buku sekolah macam kak ngah baca buku cerita. Mesti lagi pandai. Buku cerita tu tak bagi faedah satu apa pun” My mom said that every time I finished my ujian bulanan when my results was not as good as it should be. And I simply told her, “Nanti periksa akhir tahun, angah buat betul-betul lah.” And I always delivered that promise. During my final end of year exam, I made sure I did well enough to maintain in the first class. And in all my national big exams, I got straight As… because I was able to cram in the last minute. I was happy to push myself and went all out during those final moments as long as throughout the year I can enjoy my hobby. And this pattern of last minute cramming persisted throughout medical school. But I think, it must be the ageing process in me. I cannot cram as well as I could when I was younger! I think the recent exam was the hardest exam of my life! I am not kidding! Not joking! Not exaggerating! It was HARD!! I fear for my result but knew that it is too late to regret. I must learn from this lesson and do better next time. I hope I will pass even though I knew it would take a miracle. This time, I cannot break my post-exam promises. I know now that my brain is not as good as it was before. I cannot afford to waste my time with fiction anymore. Cramming doesn’t work as well as it used to. I told myself, that I have to do what I have to do. This time, what I HAVE to do is stop being so absorbed in fiction and grow up into a responsible adult who does what she must! And that is painful. Like making over my life. I hope, I don’t break my post-exam promises this time. God knows I cannot afford to break them. P/S: I just finished reading Dan Browns’ latest book entitled Origin that came out just a few weeks ago. But that was not exactly breaking my post-exam promises. I specifically wanted a break after the exam, so I read the book to reward myself after the crazy tough exam. But my next reading will be next week. I will try to stick to the schedule. Once a week. No more! Yup! Wish me luck, won’t you? That is my maxim in life. Regardless of your feelings, if something must be done, then it must be done. I am a problem solver. I don’t allow problems to continue wreaking havoc in my life. I might not like certain things, but if there is no getting around the problems/issues, then I will make myself deal with it. I used to dread socializing. I couldn’t make myself do it as a child. I always pestered my mom “Mak, bila nak balik rumah kita ni?” whenever we were out socializing at other people’s houses. My mom had to excuse herself early than she intended to because it would not take long for me to start causing tantrum. I didn’t think I had any social anxiety or social phobia. I just felt awkward having to pretend that I was interested in other people when I actually didn’t. I felt awkward having to suffer the painful silence as the conversation dried up with no one having anything to say. I was just bored. And could not make myself put the effort. I always had some excuses. Tidur. Baca Buku. Tak perasan orang mai. I am not shy. I never was shy. I am just an introvert. But when it comes to things I am really interested in, I can be chatty enough and sometimes downright vocal. I am a vocal introvert. If a topic interests me, you will have a hard time shutting me up. But if a topic does not interest me (let’s just admit that small talks are crazy boring and we just do it socially in order to be polite) or I am meeting someone for the first time, I would be very reserved and awkward and therefore I would try my best to avoid having to deal with such a situation. But I knew I could not get away with excuses for long. So when one day my patient came to me and told me that she was a very shy person (but her shyness is not yet a disorder of any kind) and she didn’t like that shyness (she is a shy extrovert. Yes, there exists a shy extrovert; just like there exists a bold introvert) I was very sympathetic with her plight. She reminded me of my younger self. Like me, she has problems coming up with something to say to keep the conversation rolling and ends up not saying anything and then the whole awkward silence embarrasses her. This inspired me to write about tips on how to make a small talk for this post. I would share with you what I do to make small talk appear effortless. (I am not always spot on and successful in how I do it. But at least, I no longer feel agonized when I have to do it) Hope it helps everyone out there who has the same problem as me and this patient of mine. All these tips are the result of my reading, my observation of other people’s conversation and from my own extended practice at small talk. I am very proud of these tips because I think it’s been working great for me. Maybe you can practice them when you are attending the many open houses throughout this month of Syawal. -Ok, my sisters would laugh their heads off at this. Because I am actually not approachable at all. My colleagues and my own close friends had told me of their first impression of me so many times in the past for me not to have a good insight of my unapproachability. They said it was my bitchy-resting-face that scares people from trying to approach me. But that is because I was not trying to be approachable at that time. I was not making any effort to seem approachable because the situation didn’t require me to do so. 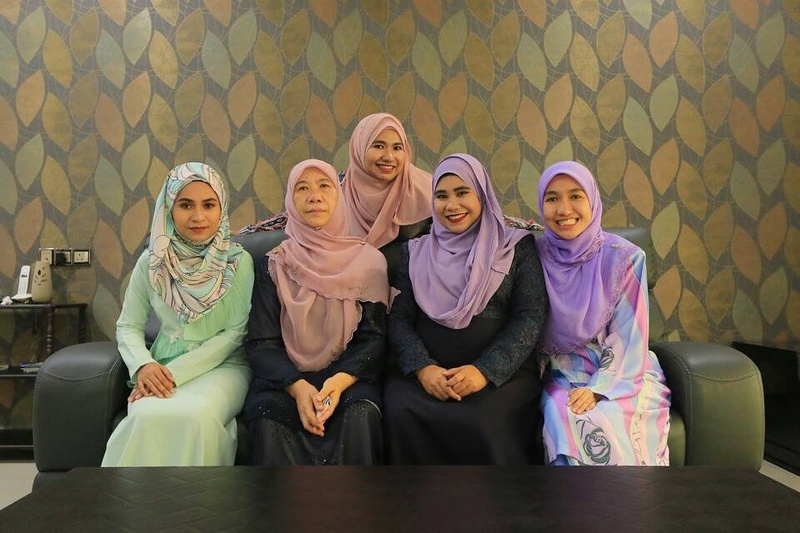 -But what if you are attending a social function or you yourself is the host for a kenduri or a family event? You have NO CHOICE but to mix and mingle. In THAT situation, I MAKE myself approachable. The simplest thing to do is smile! And talk about food. And keep asking them to “tambahlah lagi,” or “makanlah lagi”. You know, things like that! Over and over again. So bosan, but you get the idea. -Or if you are the guests (instead of the host), you can comment on the deliciousness of the food. Or exchange recipes on how to make some of the delicacies (even though you KNOW you are not going to cook any of it. But just show that you are interested in all the ingredients and how to prepare them. The point of the whole thing is just to keep the conversation rolling. Yes… we have to suffer the boredom! But you have to do what you have to do.). -The point is just to keep it superficial and light. -Avoid talks of politics/race/religion. Again, keep it light and superficial. (unless you are lucky enough to find that rare deep thinkers among the guests with whom you can talk about any controversial topic that strikes your fancy. In that case, go ahead and show your true nerdy, geeky colours. Hahhah). 2)Go to an event with a friend(s) who is more outgoing and extrovert than you. – This is my favourite trick! And it works every single time! -This friend can do all the approaching and all the talking with the host and you simply comment and interject every now and then. Whatever it is your outgoing friend said, you simply confirm it and elaborate on it. That way, you don’t need to rack your brain trying to come up with things to say because your bubbly friend will do it for you. -I see how great this works every day between my mother and my father. My mother do all the talking/ ice-breaking and my father do all the nodding and brief elaboration. It’s like watching a beautiful dance. But you must see my father when he is talking politics/business… THEN, he can really talk! Hahah. 3)People like to talk about themselves. So, ask them questions about themselves. And elaborate and respond accordingly based on their answers. Ask them about their children. People love talking about their children (something free, single people like me might not be able to relate yet). This is something I notice in almost everyone. And please, appear interested with their answers. When they give their answers, you follow it up with further questions. Kak N: Dah tahun tiga dah. Kak N: Tu lah… lega lah. Tinggal dia sorang ja tak habis belajar lagi. Lepas ni Kak N tak gaduh pikiaq dah. Hahha. Yes, I have sooo mastered the art of making small talk! Now, I can do it almost automatically! It was painful at first. But I did it! So the tips is simple: Keep the conversation rolling by asking questions about themselves because people love talking about themselves and follow up on their answers with appropriate comments (even when you have to say the obvious, and feeling stupid for saying such an obvious thing). And when you have nothing else to say on one topic, introduce another related topic with another question. Do NOT abruptly introduce on an unrelated topic because that would’t look or sound smooth. ‘Related-ness’ and ‘smooth transition’ of one topic after another, after another and after another…. that is the trick! Mr. Darcy: I do not have the talent of conversing easily with people I have never met before. Elizabeth Bennet: Perhaps you should take your aunt’s advice and practice? Elizabeth Bennet was being sarcastic but quite accurate! Back in form 4, I hated Add Maths… but I wanted to get straight As, and therefore Add Maths must be mastered by me no matter what. So I practiced Add Maths in every spare moment I had leading to SPM and I made it happen, thank God! Socializing is just like Add Maths! If socializing was made an exam subject, I bet I would bother to master it ever since I was a child. But unfortunately, it was not an exam subject. I didn’t feel the importance or the need to master it the way I had to master Add Maths. I thought that socializing involved a lot of discomfort and play-pretend and I would not stoop to that level, I felt. I should be myself, I thought. But I had my paradigm shift, thanks to Elizabeth Bennet! Haha. She made me realize that socializing is a skill… some are natural at it and some require practice with it. Just like Add Maths! It is not about not being yourself and being pretentious…. you practice it because it is a life skill! If you can practice Add Maths, why can’t you practice socializing? Right? I didn’t go around saying “Practicing Add Maths is like being fake and pretending to like Add Maths.” No! I STILL don’t like Add Maths. But I had to do what I had to do, remember? 5) Try to be as genuine as possible even though socialising requires some amount of ‘faking an interest’. Just because socialising does require an amount of faking your interest (by asking questions you don’t really actually want to know), it doesn’t mean you cannot be genuinely yourself. What do I mean by this? For example, when people ask you questions, you can answer those questions honestly. They might ask you back the questions you have asked to them. You: Anak hang Aidan buat apa sekarang? Acquaintance: Dia buat engineering la ni. Alhamdulillah, results okay. Pointer four flat baru-baru ni. Alan pula buat apa la ni? Socializing is not something we introverts are naturally good at… so it does require an effort to fake an interest and to ‘seem’ like we are enjoying ourselves. Our general demeanour might be jovial, but inwardly we might be longing to get home and get started on our reading. We have no choice but to fake this general happy demeanour in order to maintain politeness. (it would be rude to have people think we feel bored by their conversation, right?) But that is where the faking stops…. the actual content of the conversation must be real and true. But I don’t suggest you to buy any books for it. Internet articles will do. Because like Add Maths, you cannot just read on it! Practice is key! But reading on the theories would come in handy too…. so just read off the internet on that subject. And then go out to practice. Practice, practice, practice. I have mentioned before that the ‘self’ is fluid and changeable. That is why I always say ‘we do what we have to do’ regardless of our discomfort or real feelings about it. If that is our responsibility and it is expected of us, then we have to learn to adapt. Instead of having a ‘fixed mindset’, we must have a ‘growth mindset’. When you have a fixed mindset, you believe that you either are or aren’t good at something, based on your inherent nature, because it’s just who you are. Whereas people who have a growth mindset believe anyone can be good at anything because your abilities are due to your actions. And personally, I think having a fixed mindset is harmful and one of the perpetuating factor to depression and anxiety. If you believe that you cannot change even when what you are doing is not working in your favour, then what else is there to do but to give up? This is what I always tell my patients. To have a growth mindset! Remember Elizabeth Bennet? She told Mr. Darcy to practice! Practicing is something that those who have a growth mindset will do. So, all the best to all aspiring socialites out there! We can do this! 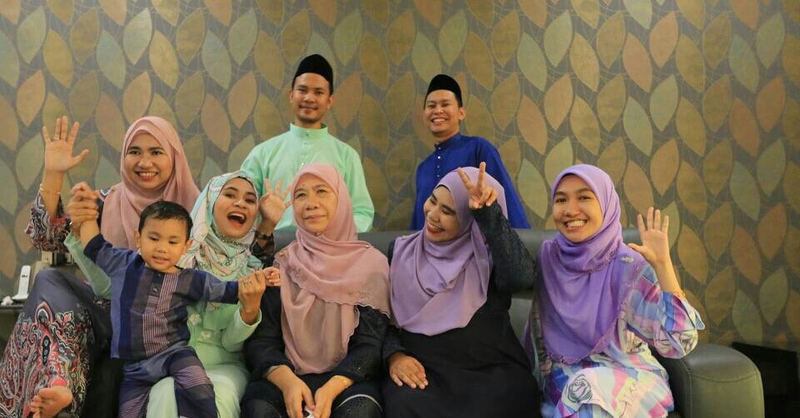 Last but definitely not least, Selamat Hari Raya from the Azmee family and Maaf Zahir Batin. Taqabballahu Minna Wa Minkum. Below are some of the pictures that we took on the first few days of Eid (some of the pictures do not contain my Kak Long as she didn’t make it back until on the 3rd day of Raya). There are a lot more pictures in Facebook and Instagram but I decide to only post a few here. I think my blog deserves a bit of colourful spicing up in this blessed month of Syawal. Our formal Raya picture. Look at my father… so serious! Hahah. Sisters Bonding Time was on the 2nd and 3rd day of Raya. 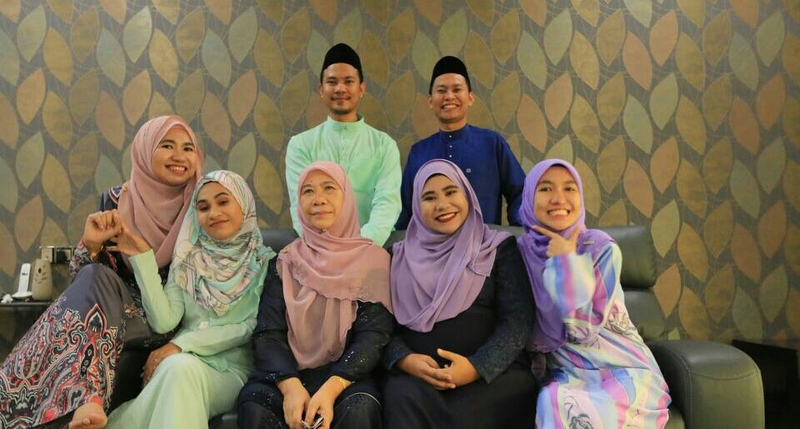 Tak sah raya kalau tak ambil gambar kat halaman rumah dengan baju raya. LOL. We missed my youngest sister because she was not around at that time. And my eldest sister was also not here because she was stuck in traffic jam on the way to balik kampung here. So just me, Izati and the heavily pregnant Alida. 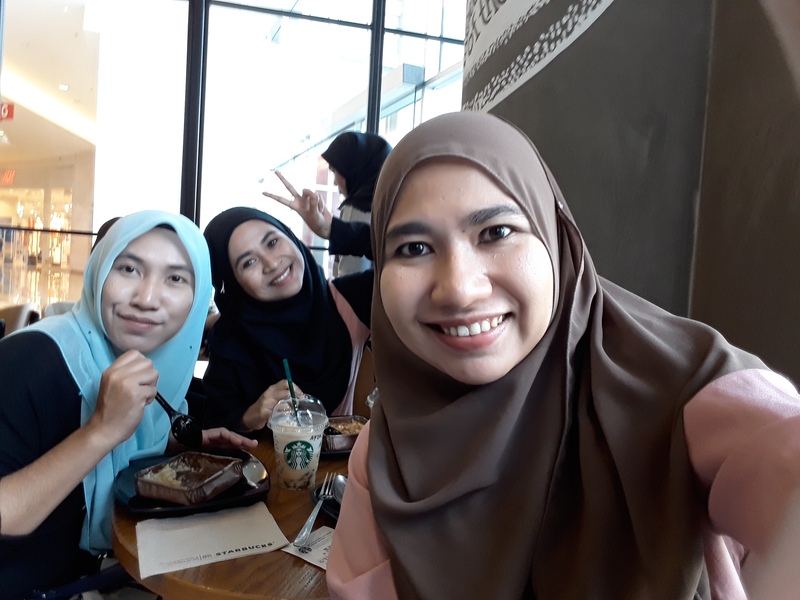 On the 3rd day of Raya, we went for our usual sisters-coffee-time at Starbucks. They left their husbands at home, because, of course! Who would want husbands to tag along when the sisters are gossiping? Right? They would only feel excluded by our loud voices speaking on top of each other as we tend to do every single time. Haha. And on the 4th day of Raya (my last day of cuti raya, sobs sobs), I brought Kak Long to Gunung Keriang for hiking because she said she wanted to give it a try. I was happy to do it because I had started feeling guilty about all the calories I had consumed in the past few days. At the end of the hiking trip, my Kak Long learned to respect the level of my fitness to be doing this activity so very frequently. Hahha. She learned that she needed to increase her fitness level ASAP. “Tunggu aku balik next time… I will be fitter,” She said. I laughed at the hilarity!